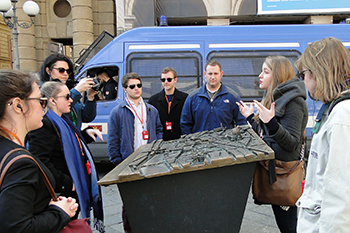 College of Law students tour Florence, where they learn about culture and artistic history. The overall purpose of the course was to give students exposure to a European approach to property law and regulation. The course, which included lectures and study prior to the trip and upon return, focused on three aspects of international land use planning and regulation: 1) Learning about property development and land planning in the context of a World Cultural Heritage location where the need for historic and cultural preservation are highly valued and regulated; 2) Learning about the civil law legal system of Italy and Europe as it relates to the particular concerns of property law; and 3) Evaluating the accessibility of the urban landscape in terms of land use law and disability. While in Rome, the students had lectures from Italian law professors, met with the president of the European Notary Society at the Rome notary office (Notaries handle all property transactions in Italy); and visited the Italian constitutional court for a tour and a personal meeting with Judge Amato (a sitting judge and a former prime minister). The meeting with Judge Amato covered a variety of topics addressed by Italy’s highest constitutional court. In addition to Rome, students traveled to Florence, where they had lectures and tours related to the cultural and artistic history of Florence, and the urban development and land planning of the city. Students also enjoyed a lecture and group meal at Villa Rosa, the Syracuse University campus in Florence. The host in Italy was Luca Arnaudo, a lawyer and Ph.D. economist who works for the Italian government and teaches at an Italian university. The program was coordinated by and sponsored by the College of Law in conjunction with SU Abroad. This was the first law course sponsored as a short course program through SU Abroad.